You can get sweet tea at McDonald’s and a mint julep with your Kentucky Derby party, though your hat might need to have a fleece lining. And more than a few of you have adopted “y’all” over “you guys.” Is the South destined to rise and seduce the rest of the country to our charms? 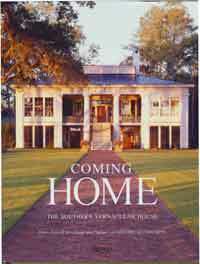 I posed that question to Aaron Daily, partner at architecture firm Historical Concepts and co-author of “Coming Home: The Southern Vernacular House,” who is coming to Ketchum’s Chapter One Bookstore on Thursday, Dec. 27, from 5 to 7 p.m. to discuss the sultry architecture of the South and its influence. The gorgeous coffee table book reminded me of the annual biblical-proportioned devouring of the Neiman Marcus Christmas Book with its wish list of luxury gifts with the Texas-size price tags. The book is an indulgent romp through the deep historic traditions in architecture, and the clients behind them are said to be in pursuit of relaxed family living. Today’s mobile world and the rootless generations that have occurred as a result are now reversing themselves, looking for a home base and a legacy. A factor, that “actually is very relevant to our design philosophy,” Daily said. The firm’s philosophy is reiterated throughout the book, with one of the guiding principles being that the land dictates the design. Still, not every place can be as verdant as the south. But Daily said the firm still relies on the existing landscape to help shape the vision. “Sure, century-old oaks dripping with Spanish moss create a very dramatic and romantic image, but a site doesn’t need green trees and lush plants to be beautiful. No matter where we’re working, the first order of business is to really understand the site—its features, its challenges, its solar orientation, its topography—because the site really influences the design. Traditional and vernacular architecture is inherently sustainable, he said. Daily said his firm isn’t seeking to convert the West into the South, but to show how the integration of styles can result in homes with a lasting style and enduring legacy. “There’s something about the South that is so compelling. But if you dissect Southern vernacular architecture, it’s simply classical and traditional architecture that has evolved in a way that meets the demands of climate and lifestyle. So in that sense, the roots of Southern architecture transcend region.